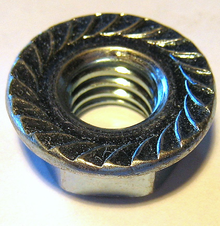 This is 1/4-20 serrated-face lock nut. But depending on the application it had differing finishes. For instance, a 55734-S2 would have been finished with phosphate and a lubricant. Refer to the Finishes table on the Fasteners page to determine the finish your application calls for.